Don’t miss the chance to learn all history about Mevlana. It’s a mind opening tour and unforgettable experience. Your professional guide is going to tell you everything that you want to know about his life and passion. Get your self ready for this breath taking story. The entire Konya was a lake 18 thousand years ago. Over 10 thousand years, it had drained to form a rich alluvial plain with fertile grazing land in the East and thick forest to the West and South. It is 5th largest city in Turkey. 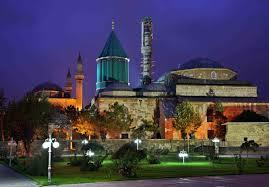 In the days of the Roman Empire, Konya was called Iconium, “city of icons”. Konya has become a place of pilgrimage for Moslems because the leader of the Mevlevis, Mevlana Celaleddin Rumi was buried there.